One of the most-requested calibers for us to add to our ballistic gelatin testing project is easily .357 Sig. This cartridge made its debut in 1994 and saw some success among law enforcement in the late 90s and early 2000s and it remains the standard issue caliber for a handful of notable LE agencies such as the Federal Air Marshals. It has never been particularly popular in the civilian world, but .357 Sig has maintained enough fans to keep the cartridge in steady production with a few JHP offerings from all of the major ammo manufacturers. We tested nine of these loads using the same protocol outlined in our previous test descriptions. To summarize, from a distance of ten feet, we fired five rounds of each load into a 16-inch long block of Clear Ballistics synthetic gelatin with a second block behind it to catch any bullets that penetrated deeper. A 4-layer barrier of heavy clothing material was placed in front of each block. We also measured the velocity of each load with a chronograph. The goal of these tests is to measure the penetration depth of each bullet as well as how wide the bullet expanded beyond its original diameter. The ideal penetration range we’re looking for is 12-18″, which has been proven to correlate with bullets that perform well in real world shootings. We’ve highlighted that range on our chart below so you can easily see if a given load performed within that standard. Bullet expansion is also beneficial when it can be achieved without sacrificing penetration. Ideally, bullets will expand at least 150% of their original diameter. The bullets used in .357 Sig are actually .355” in diameter, so the ideal minimum expanded diameter for this caliber is .533”. As in all of our previous tests, we used blocks of the synthetic Clear Ballistics gelatin instead of the organic-based 10% ordnance gelatin originally used by the FBI and other professional ballistic researchers. The synthetic gel and the organic gel don’t share all of the same physical properties, but in our experience, the penetration and expansion results for handgun ammo tend to be similar and the Clear Ballistics gel is far less labor intensive to work with. 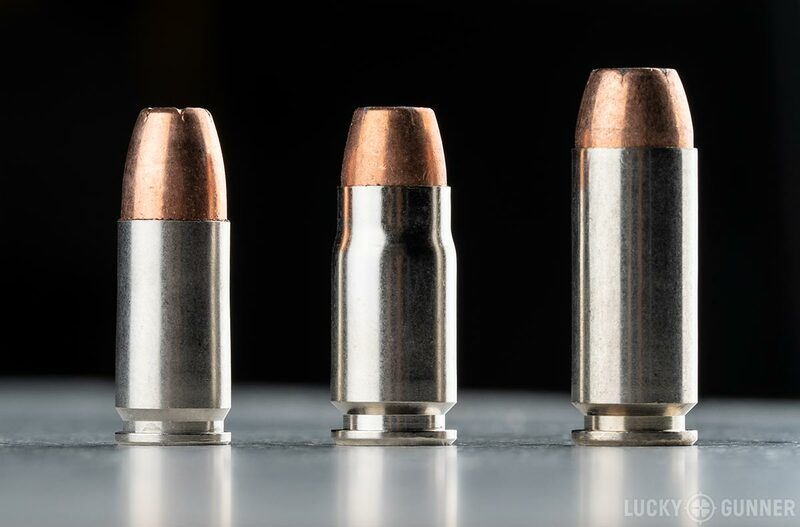 .357 Sig (center) was developed from a 10mm case (right) necked-down and shortened to accept a 9mm bullet (left). 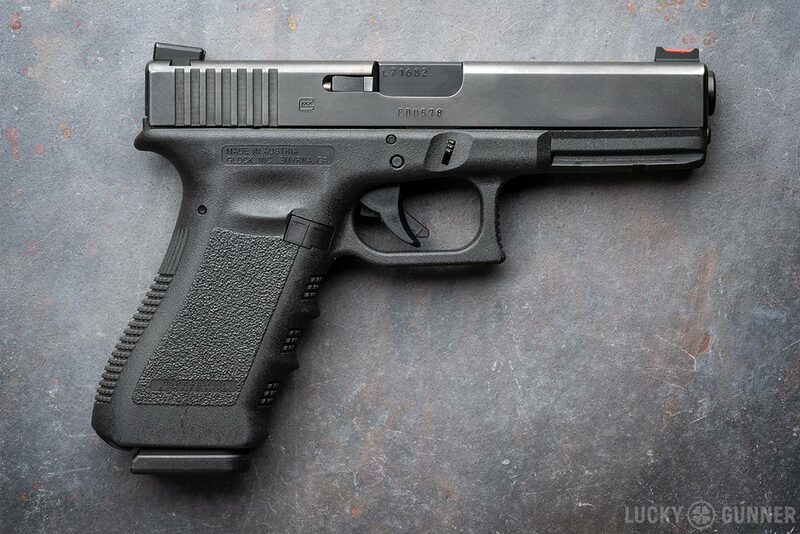 The test gun we chose is a Gen 3 Glock 31 with a 4.49-inch barrel. Well, technically, it’s a Gen 3 Glock 22 (originally chambered in .40 S&W) with a Glock factory .357 Sig barrel and magazine. The only real difference between that and an actual Glock 31 is the model number stamped on the slide. We’ve indicated “Glock 31” as the test gun on our chart to avoid confusing anyone who may have skipped over this paragraph. Like our 10mm test, we opted to use a full size gun for .357 Sig rather than the ~3.5-inch subcompact barrels we used in our original semi-auto calibers test. There are not very many subcompact .357 Sig pistols being produced these days, and most fans of this caliber seem to be using guns with 4-5” barrels. On a practical note, we already had a .357 Sig barrel for our Glock 22 so we decided to start with that rather than buying additional hardware. If we get enough requests, we might revisit this caliber in the future and see what it can do with something like a 3.4-inch Glock 33. Be sure to let us know in the comments if you’d like to see that happen! Our test gun was a Glock 22 with a factory Glock .357 Sig barrel in place of the original barrel chambered for .40 S&W. Of the nine loads we tested, all but two utilize a 125-grain bullet, which is the bullet weight this caliber was originally designed for. Four of the nine loads showed average penetration inside the ideal FBI 12-18” standard along with consistently optimal expansion. Allowing for a small amount of overpenetration (which is not uncommon in the Clear Ballistics gel), another two loads make the cut, leaving only three that displayed less than ideal performance. Don’t forget to check out all of our other ballistic gel tests. Here’s a full index of the calibers we’ve covered so far! What caliber should we test next?